Greetings, in these last hours of Earths history. As many are probably aware, there has been a bit of a firestorm brewing in Oregon lately. It turns out Larry Weathers, a 50-year-old barber from Talent, Oregon, has placed a billboard located along Interstate-5 just north of Medford, Oregon proclaiming in big bold letters, "The POPE Is The ANTICHRIST, Free Proof," He then provides a website address for free information regarding same. Mr Weathers says he will not take the sign down despite several threats he has received on his life. Weathers happens to be a member of the Seventh Day Adventist Remnant Ministries. It is indeed the last days when one realizes that preaching Biblical facts result in several threats on ones life. Saddly, this is the norm for those that think they are "doing God a service" when they threaten and even kill Christians that proclaim Truth and refuse to bend. Why is it they cannot see that to threaten to KILL a man is no different than actually KILLING that man in reality in the eyes of the Lord? Did Jesus not proclaim that to break the 7th commandment in the heart is the same as breaking it in reality? For it is written in Matthew 5:28, "But I say unto you, That whosoever looketh on a woman to lust after her hath committed adultery with her already in his heart." Is not the 6th commandment declaring that "thou shalt not kill" thy fellow man? To threaten a man's life, is to make the decision in the heart that you WANT him dead already! This is no different than looking upon a woman in lust, and wanting her in your heart as well. It is a sad day for all those are NOT Christians as well. How so? So many people of different cultures the world over look unto the Roman Catholic church as a Christian church. When they see with their own eyes Catholics threatening to KILL people, they make a descision to embrace other gods of the world instead of the one that created it. They honestly think that the Christian faith is a lie because they see Catholics looking to kill people IN THE NAME of Jesus Christ. Yet is it not written in the Christian Bible in Luke 3:14 that we should, "...Do violence to no man"
Are Christians capable of doing violence? Is it a Christian fruit to threaten the life of a man? Or is it the fruit of the wicked to do such an act? Proverbs 10:11 declares, "The mouth of a righteous man is a well of life: but violence covereth the mouth of the wicked." It is also recorded from the mouth of Cardinal Bellarmine in, "the famous champion of Romanism" cited by Schumucker p. 76 "Experience teaches that there is no other remedy for the evil, but to put heretics (Protestants) to death; for the (Romish) church proceeded gradually and tried every remedy: at first she merely excommunicatied them; afterwards she added a fine; then she banished them; and finally she was constrained to put them to death." I would like to share with you at this time a couple of articles that have reported on this billboard. (AgapePress) - The nation’s largest Catholic civil rights organization is criticizing an Oregon advertising company which recently accepted a billboard proclaiming the Pope as the Antichrist. Officials with the Catholic League say they’ve tried numerous times to contact the Oregon-based Outdoor Media Dimensions to post a rebuttal to a sign along Interstate 5 near Medford. 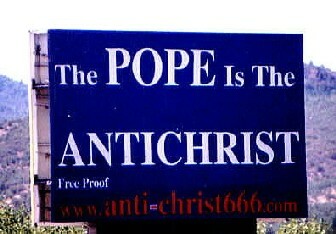 The billboard sparking the controversy reads “The Pope is the Antichrist ... Free Proof” and offers a website for more information. ...The message is sponsored by Larry Weathers, a 50-year-old barber from Talent, Oregon, who says he will not take the sign down despite several threats on his life. Weathers is a member of the Seventh Day Adventist Remnant Ministries. CENTRAL POINT, Ore. – A billboard proclaiming the pope is the Antichrist has unleashed the wrath of the Catholic community, sparked a debate over First Amendment rights, and led to death threats against the man behind the message. The red, white and blue sign, located along Interstate-5 just north of Medford, Oregon reads, "The POPE Is The ANTICHRIST, Free Proof," and provides a website address for more information. "It was like, 'Oh my God, why would anyone want to do that?'" exclaims Rose Khng describing her initial reaction to the billboard. "It was very offensive, extremely." Larry Weathers, a 50-year-old barber from the small town of Talent, sponsored the sign. He says he has no intention of taking it down, despite a flurry of death threats. "As long as they're threatening this and not shooting," Weathers tells WorldNetDaily. "And they've got to go through God [to kill me]. If He says it's all right, then I can't argue with that." Weathers has been flooded with reaction – both negative and positive – since an editorial published this week in the Catholic Sentinel urged the public to call for the sign's removal. The Portland-based publication bills itself as the oldest Catholic newspaper on the West Coast. "It's just about 50-50," Weathers says of the nature of the calls. "Many people tell me what my mother is for bringing me into this world." LATER IN THE ARTICLE IT STATES THAT...Weathers contends any examination of end-time prophecy will clearly demonstrate that the pope is identified in the Bible as the "man of sin," "son of perdition" and "whore of Babylon." "I wasn't looking to join a church, I just wanted to join the truth," explains Weathers, who meets with about 40 people as part of The Rogue Valley Historic Seventh-day Adventists (which has no connection to, and is shunned by the more well-known Seventh-day Adventists.) It was Weathers' belief that the seventh day of the week, Saturday, is the Sabbath day of rest for followers of God that originally prompted him to post billboards. It has been a labor of love for him since 1993. Despite the harsh rhetoric and threats against his life, Weathers insists he's neither hateful nor bigoted in any manner. In fact, he believes he's acting out of love for Catholics and the public at large. He likens himself to Noah of the Old Testament who warned of coming catastrophe unless people repented and followed God. "I can't see Noah saying 'Forget about all those raindrops!' as he's shutting the door to the ark," laughs Weathers. "Noah warned 'em and that's what we're doing." "It's no different from yelling 'Fire!' to save people from being burned," he adds. Being in this type of ministry one can understand that death threats DO become a normal occurance, I myself have seen many. However, since the Catholic Sentinel urged the public to call for the sign's removal, Larry Weathers tells us that he has received a "flurry" of death threats as well as other methods of hatred. Since 1993 this billboard has been standing, but it wasn't until the Catholic Sentinel asked all their subscribers to make a public outcry did Mr Weathers notice an increase in death threats. Sadly, this appears to be the norm for Rome. Just as prophecy declares, the Antichrist WILL use any means possible to stop the Truth from going forth. Even if it means threatening the lives of those that preach it. Rome has always felt it was her responsibility to use force in order to spread the doctrines of Catholicism. In the book, "The Catholic Church, The Renassance, and Protestantism, pp. 182-183" it is stated, "The rector of the Catholic Institute of Paris, H.M.A. Baudrillart, revealed the attitude of the church and her leaders toward persecution. "When confronted with heresy," he said, "she does not content herself with persuasion, arguments of an intellectual and moral order appear to her insufficient, and she has recourse to force, to corporal punishment, to torture." Many Catholics to this day are unaware that their church still holds to such barbaric customs as these in the name of Christianity. Could it be, those that have sent death threats to Mr Weathers are those that still embrace the words of John J. Oberlander as the proper Catholic conduct? He stated back in 1954 in "The Voice of Freedom" on page 20. "The defense of Roman Catholics to this presentation is as follows: "Communists destroy churches because they are God's enemies; Catholic's destroy churches because they are God's friends... Against such men-founded churches... Catholics in Latin America should arise and wipe them out with fire." And why do you suppose many will do as Rome prods? According to the Western Watchman of December 24, 1908, "The Catholic Church has persecuted ... when she thinks it is good to use physical force she will use it... Will the Catholic Church give bond that she will not persecute?... The Catholic Church gives no bonds for her good behaviour." To get the government of a country's support to kill over 60,000 souls because they differ in religious belief. And then roar across Latin America for all catholics to rise up and kill "with fire" their neighbors that don't agree with such evil tactics, is absolutely insane. And when they are confronted on their apparent boldness of heresy they reply that they have no fear of the authorities and they have every right to force, put to death, and even torture whomever they please. You ask yourself, is this Christlike? Does the church of Rome still declare those that do not embrace Catholcism heretics? Is this not only a historic fact, but a modern fact of Rome as well? Did not John Paul II declare on March 12, 2000 in his "mea culpa" that the millions killed by the Roman Catholic church were killed as HERETICS? Is there evidence of this hatred for those who are not Catholics still evident today? Besides the obvious detah threats brother Weathers has realized, let me share this short article with you. Brother Larry Weathers and many like him are merely reporting on a Truth that was proclaimed long ago. The Word of God is jam packed with Truths that most people in the world today cannot understand. That's mainly because it IS the last hours of Earth's history and most people are walking the way of Antichrist already. They cannot understand the prophecies, they cannot see the signs, they cannot hear the Truth. And this is mainly because their Pastors, Preachers, Ministers, and Priests REFUSE TO TELL THEM! And why is this? Because they simply do not believe the Bible. Case in point. Did you know there was a poll taken by the "Pittsburgh Press" on Sept. 24th 1977? In which was revealed that only 2% of American student ministers actually believe in the second coming of Jesus Christ! That was over 20 years ago! These "students" are Pastors, and Teachers TODAY! These that proclaim they do NOT believe in the second coming of Jesus Christ as Biblical fact, have been preaching to this generation for at least 20 years now. Almost everywhere you look you find people that simply do not believe Jesus is coming back! And it's not always because they choose not to believe the Word of God. It's mostly because their Pastors have refused to tell them ALL the Truth within the Word of God in regards to Antichrist. On my website I have a large list of forefathers of all the main denominatiosn of today. They ALL proclaim the Popes Antichrist. Yet, today, these same denominations refuse to preach what their founders wholeheartedly believed. Could it be they are adhereing to the edict of Pope Leo X? In the year 1516AD Pope Leo X proclaimed, "No person shall preach without the permission of his Superior. All preachers shall explain the Gospel according to the Fathers. They shall not explain futurity or the times of Antichrist!" The Gospel according to the fathers? What of the Gospel according to Matthew? Mark? Luke? Or John? Matthew 18:6 says, "But whoso shall offend one of these little ones which believe in me, it were better for him that a millstone were hanged about his neck, and that he were drowned in the depth of the sea." The point made here is apparent. The little ones are those that already believe in Jesus. The Lord is declaring plainly that if we as men and women of God approach one that IS a true believer, and then proceed to twist or omit that which is written so much so as to offend, THAT is wrong! The Catholic children trapped within the grasp of Antichrist ARE UNAWARE of what is written. Their religious leaders have been caught red handed countless times twisting and ommitting that which is written so as to preach their Antichristian doctrines to them and their loved ones. And all the churches of today are doing as the "mother church" of Rome has taught them. Anyone with a Bible can simply research this and see for themselves the simple truth in this. Prophecy is 100% accurate! And seeing how some of us do in fact understand these prophecies, it is our job to WARN them! Ezekiel 3:18 tells us that, "When I say unto the wicked, Thou shalt surely die; and thou givest him not warning, nor speakest to warn the wicked from his wicked way, to save his life; the same wicked man shall die in his iniquity; but his blood will I require at thine hand." It's not only the wicked that need to be warned my friends. For it is also written in Ezekiel 3:20, "...When a righteous man doth turn from his righteousness, and commit iniquity, and I lay a stumblingblock before him, he shall die: because thou hast not given him warning, he shall die in his sin, and his righteousness which he hath done shall not be remembered; but his blood will I require at thine hand." Understand, Larry Weathers, and many children of God like him are simply doing as they are told by their Heavenly Father. They are warning people! It's is because of love we preach this message. It is because we do not want those that are trapped in Satan's grasp to remain there. And sadly many will choose to ignore the watchmen on the wall. This billboard is merely stating there is a "sword in the land" people! The children of God are merely blowing the trumpet of warning is all. It is Biblically simple. Ezekiel 33:1-6 ever so plainly stated... "Again the word of the LORD came unto me, saying, Son of man, speak to the children of thy people, and say unto them, When I bring the sword upon a land, if the people of the land take a man of their coasts, and set him for their watchman: If when he seeth the sword come upon the land, he blow the trumpet, and warn the people; Then whosoever heareth the sound of the trumpet, and taketh not warning; if the sword come, and take him away, his blood shall be upon his own head. He heard the sound of the trumpet, and took not warning; his blood shall be upon him. But he that taketh warning shall deliver his soul." Like the nonbelievers in Jerusalem in 70ad, most people refuse to research the prophetic FACTS of the Word of God. They ignore the trumpet blast. However, the true Christians that were in Jerusalem at that time understood plainly what Jesus was warning them of when they saw the "abomination of desolation" standing there, they did EXACTLY as Jesus said to do. They fled! However, history records, those that ignored the prophetic facts DIED that day. Brother Larry Weathers, like many Christians before him are merely warning the people of a real danger. And how real is this danger? Is there Rock hard evidence that the Popes of the Roman Catholic church are Antichrist? Are there really prophecies that are directly linked with historic facts proving who Antichrist is? At this time I would like to share with you a small portion of the extremely large collection of prophecies that have been investigated and proclaimed by Christians the world over. For centuries these Truths have been made known to the Elect. And many of them were indeed put to death in a bevy of torturous ways by the Roman Catholic church for preaching these facts. On March 12, 2000 Pope John Paul II did in fact admit the Roman Catholic church did kill millions upon millions of Christians. Some were burned at the stake, some were boiled in oil, some skinned alive, some drawn and quartered, many were cooked to death, hung, shot, or impailed. Many were emasculated, some were frozen to death, others even had their babies cut from their wombs, and as they died, they watched as their babies heads were slammed against stone walls. The list goes on and on folks. It's not an easy topic to share. However, truth is truth. By the way, thank the Lord Jesus Christ for allowing you to be alive in these last days. We now have the benefit of Historic records at our fingertips today. History is mostly behind us! We have PROOF the prophecies were fulfilled exactly as the Bible said. We now need to take the advantage of the historic records. So... moving on... What are some "quick facts" that prove brother Larry Weathers and many like him are 100% correct in proclaiming the Pope Antichrist? The whore will be a church & state combined. Revelation 17:3, "So he carried me away in the spirit into the wilderness: and I saw a woman sit upon a scarlet coloured beast, full of names of blasphemy, having seven heads and ten horns." The whore of Babylon will sit upon 7 hills. Revelation 17:9, "And here is the mind which hath wisdom. The seven heads are seven mountains, on which the woman sitteth." The Beast will rise from the "sea" Revelation 13:1, "And I stood upon the sand of the sea, and saw a beast rise up out of the sea,"
Fact: Roman Catholicism arose out of Western Europe with a multitude of "peoples, nations, and tongues" as parishoners. At present the Roman Catholic church sports the highest number of "peoples, nations and tongues" the world over. Fact: Over 100 Nations have state representatives at the Vatican. The four Beasts of Daniel will join as one in the last days as Antichrist. Daniel 7:2, "Daniel spake and said, I saw in my vision by night, and, behold, the four winds of the heaven strove upon the great sea." Antichrist will be a strong Political power. Revelation 13:3, "...all the world wondered after the beast." Revelation 13:7, "... power was given him over all kindreds, and tongues, and nations." The Beast will control a man and his name will equal 666. Revelation 13:17,18 "And that no man might buy or sell, save he that had the mark, or the name of the beast, or the number of his name. Here is wisdom. Let him that hath understanding count the number of the beast: for it is the number of a man; and his number is Six hundred threescore and six." Fact: Documented Roman Catholic source states "The letters inscribed in the Pope's miter are these 'VICARIUS FILII DEI'. which is the Latin for 'VICAR OF THE SON OF GOD.' Catholics hold that the church, which is a visible society, must have a visible head...., as head of the church, was given the title, 'VICAR OF CHRIST'." Our Sunday Visitor, (Catholic Weekly) "Bureau of information," Huntington, Ind., April 18, 1915. The Roman Church would reign for 1260 years before being "wounded unto death." Revelation 13:5, "And there was given unto him a mouth speaking great things and blasphemies; and power was given unto him to continue forty and two months." The forty two months of Rev 13:5 and the "time, and times and dividing a time" of Daniel 7:25 equal the same thing. 42 months = "3 1/2 years" A "time (one year) and times (+ two years) and the dividing of time, (+ half a year ) = three and a half years, or forty two months (12+24 + 6 = 42 months) And then Revelation 12:6 confirms this when it says that the church of Jesus would hide in the wilderness for exactly 1260 days. 42 months, or 3 and a half years equals 1260 days. Still, some will say that 42 months does NOT equal 1260 days because all our months do not equal 30 days each. The fact here is, prophecy speaks of Biblical months. To understand the forty and two months, or the time, and times and diving a time, that the beast will reign, we must first find the method of time the Bible declares for prophecy. God says in Ezekiel 4:6 "I have appointed thee each day for a year" And we also find the Bible acknowledges a month to be 30 days long. Because in, Genesis 7:11 we see the rain started in Noah's day on the 17 day of the 2nd month and in Genesis 8:3,4 we find the water receded at the end of exactly 150 days, then it says the ark rested on the 17th day of the 7th month. That's exactly 5 months to the day. If we divide the 150 days by the 5 months you get 30 days per month. So 42 months multiplied by 30 equals 1260. And according to Ezekiel 4:6, that's 1260 years that Papal Rome would reign as a church and state. Historical records reveal the papacy began its reign in 538 AD upon Emperor Justinian's decree, and under the military protection of Belisarius. And the Bible says the beast will rule for EXACTLY 1260 years before receiving a mortal wound. Now it's just a matter of simple mathematics. It is also a grand method by which to see the Lord glorified. If the prophecy is correct, 1260 years after 538 AD the Beast must receive a mortal wound. If you add 1260 years to the beginning year for the Roman Catholic church, 538 AD, you will arrive in the year 1798 AD. So, according to the Bible we are told the first reign of the Beast will last till the year 1798 . So, did it end in 1798, and how? First understand, according to the prophecy, we learn that, "He that leadeth into captivity shall go into captivity: he that killeth with the sword must be killed with the sword..." Revelation 13:10. That's Exactly 42 prophetic months, or 1260 years, or a time, and times, and dividing a time after the Papacy began its powerful reign that the Pope "shall go into captivity" by the military! By the way, to further illustrate this to be fatc, shortly after his captivity the Pope did in fact die, in exile. This wound administered to the Beast will be healed: Revelation 13:3, "... his deadly wound was healed: and all the world wondered after the beast." The beast is one that "was", "is not" and "yet is". Revelation 17:8, "...behold the beast that was, and is not, and yet is." ...and is not:: From 1798ad until the signing of the Lateran treaty in 1929 the Roman Church/state was non-existent. The Beast will be a blasphemous beast: Revelation 13:1, "And I stood upon the sand of the sea, and saw a beast rise up out of the sea, having seven heads and ten horns, and upon his horns ten crowns, and upon his heads the name of blasphemy." Fact: Blasphemy defined: John 10:33, "The Jews answered him, saying, For a good work we stone thee not; but for blasphemy; and because that thou, being a man, makest thyself God." -AND- Mark 2:7, "Why doth this man thus speak blasphemies? who can forgive sins but God only?" Three nations will be destroyed by the Beast: Daniel 7:8, "I considered the horns, and, behold, there came up among them another little horn, before whom there were three of the first horns plucked up by the roots: and, behold, in this horn were eyes like the eyes of man, and a mouth speaking great things." The beast will understand and do as Satan requests. Daniel 8:23, "And in the latter time of their kingdom, when the transgressors are come to the full, a king of fierce countenance, and understanding dark sentences, shall stand up." The beast will seek to change times and laws. Daniel 7:25, "And he shall... think to change times and laws:." Rome will give its power to the Catholic church: Revelation 13:4, "And they worshipped the dragon which gave power unto the beast..."
It will be a MOTHER CHURCH: Revelation 17:5, "And upon her forehead was a name written, MYSTERY, BABYLON THE GREAT, THE MOTHER OF HARLOTS AND ABOMINATIONS OF THE EARTH." Fact: June 26, 2000 the Vatican became the MOTHER of the one world church. It will attack the children of the Creator. Revelation 13:7, "And it was given unto him to make war with the saints..."
Fact: March 12, 2000 Pope John Paul II admitted the Roman Catholic church did in fact kill well over 100 million Christians. It will be a Christian church doing Babylonian (Pagan) acts: Revelation 17:5, "And upon her forehead was a name written, MYSTERY, BABYLON THE GREAT..."
PRESENTS OF GOD ministry is now in Oregon as well! That's right! The Truth Provided Newsletter is now ON THE AIR in Springfield Oregon Wednesday's at 12:30pm Pacific time. Tune your radios to 1050am K.O.R.E Radio for the Loud Cry radio broadcast.